I spent this weekend watching and re-watching a Brazilian movie titled Abril Despedacado (literally translating to Broken April), which was released in English as Behind the Sun. 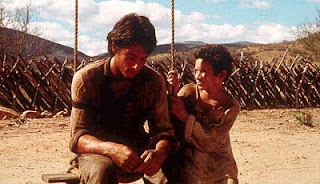 The movie is directed by Walter Salles, who has also directed the wonderful Motorcycle Diaries. I have been so touched by the movie, that I decided to write about it. The movie starts with a young boy, who introduces himself as Pacu. He goes on to explain that it is a brand new name, to which he is yet to get used to. 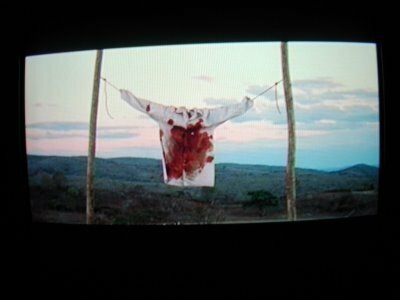 Pacu is trying to remember a story, but it gets mixed up with another story - one involving the boy, his elder brother Tonio, and a blood-stained shirt tied to the wind. Cut into flashback, we are introduced to the poverty ridden Breves family - the father who is a taskmaster, the mother who just gives in to her husband's wishes, and their two sons. The Breves make their living by farming sugarcanes and extracting sugar. Later in the movie, the father says to his wife that after loosing everything, the only thing they have left is honour. And what form does this honour take? Years earlier, we learn, the Breves got into a feudal fight with another family, the Ferreiras. The fight carried on for generations, leading to Pacu and Tonio's elder brother being killed. Now, it is upon Tonio to protect the honour of his family by avenging his elder brother's death. Meanwhile, Pacu gets acquainted with, and introduces Tonio to the vagrant circus artists Salustiano and Clara. Tonio is enticed by the beautiful Clara. Does he protect the "honor" of his family, or does he get victimized in the family feud? Does he stick to the family tradition despite knowing the futility of it all, or does he go on a quest for a better life? Will the bloody saga of family vengeance be resolved? And, what has Pacu got to do with this all? Reading my sludgy attempt to describe the plot line, you must be imagining a gory and violent movie. The movie is anything but gory. It is, to the contrary, poetic, picturesque, and heavily laden with lovely metaphors. I have listed just a few here, taking care not to have any spoilers. The Breves family crush sugarcane in a mill that is pulled by a couple of Oxen, which go round and round. Pacu points out that they are like the oxen, going round and round all day, but never going anyway. This is a remark at all of us, who are afraid to break out of our routines. Of the two brothers, the younger Pacu is more imaginative, and more dissident to the traditions. The older Tonio recognizes the futility of the family feud, but is too reluctant to disobey his father. Pacu's favorite hangout is a swing, which symbolyses freedom from their dreary routine. In a decisive point in the screenplay, Tonio is shown to be sitting on the swing. He tells to his younger brother "I thought you how to fly with this, remember? You were scared shitless". "Tonio", replies the kid brother, "today, it's your turn. You take my place, and I will take yours". "No, I don't want to" says the older brother, but is urged on by the younger one. What follows is a wonderful scene of brotherly love. This conversation also signifies the role-reversal between the bothers. In a direct metaphor, Salustiano compares the feuding family to a couple of snakes he had seen fighting. "Each was biting the tail of the other. They ate each other up until nothing was left. Nothing but a pool of blood on the ground." Apart from the symbolisms, the movie has quite a few scenes of pure cinematic beauty. The whole experience takes you to a different time and space, and the stunning climax leaves an impact for a long time after the movie ends. If you have some time to spare, I urge you to watch this one. In case you are not yet fully convinced, here is the movie trailer.